The preschool room in 1992 when 3 and 4 year olds were combined in a class. The United Methodist Church has been in the town of Shueyville, Iowa since 1956. The "Shueyville Class" of the church of the United Brethren in Christ was formally organized by the Rev. Solomon Weaver. The original congregation of 31 charter members included settlers who had migrated to this area from Virginia. In 1974, the Union Memorial Addition was added which enhanced the church by creating rooms for gatherings, meetings and educational purposes. All God's children has been a ministry of the church since 1991 and was then called the Shueyville Church Preschool. It began with 4 teachers and 24 children and was split into two rooms in the basement of the Union Memorial addition. On Mondays and Wednesdays the classes were combined with both 3 and 4 year olds and on Fridays, only the 4 year olds attended. During the day they would switch rooms. Each room had something different to offer the children such as one may have had a dramatic area and one would have had a block area. They used the community room in the church basement to enhance their large motor skills and programs. In 1999, the church began adding an addition which included a large room called the Family Life Center, a nursery, three spacious classrooms, an office/storage room, a coatroom and two rooms used for church educational purposes. The hallway includes an adult size bathroom along with an age appropriate bathroom between two of the classrooms. 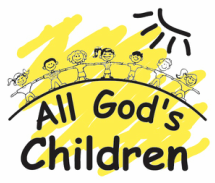 The Shueyville Church Preschool changed their name to All God's Children Preschool and Childcare when they first occupied the new addition. Now, we have two classes of 3 year old preschool and three classes of 4 year preschool. For working parents we provide quality care for both preschool and school aged children. See the tabs to read more about each program in center.